EDM Heavy-hitter Kaskade has announced a partnership with Hakkasan Group to headline a residency for the new year. 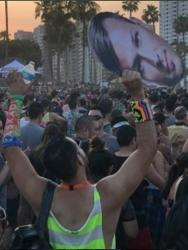 Since emerging onto the scene in the early 2000s, Kaskade has headlined major festivals around the world where his crowd easily reaches into the thousands and has released hit after hit out of his nine studio albums. The Grammy-nominated singer, songwriter, producer and DJ is scheduled to perform throughout 2017 in many of the group's premier nightclubs, including Omnia, Jewel, Wet Republic and its namesake Hakkasan. In an interview with Las Vegas Weekly, Kaskade said that Hakkasan Group has given him a lot of freedom with his new residency. When asked what played into his decision to partner with the group, he said they have established themselves as creative titans in a city full of creative giants. The hitmaker will kick-off his stint on December 30 at Omnia Nightclub inside Caesar's Palace. For more information, including show dates and tickets click here.